Flavio Briatore worked his way up from humble beginnings but was convicted of fraud and sentenced to prison for fraud, avoiding incarceration by fleeing abroad until he was legally able to return to Italy. At this time he was working for Benetton and in 1979 he was appointed to head its US operations. He made his fortune from franchising the company's outlets and in 1988, despite having no real interest in Formula One, he was appointed commercial director of the F1 team, quickly becoming managing director. Under his control and with Michael Schumacher leading the team, Benetton won drivers' and constructors' titles. In 1994 Briatore bought the struggling Ligier team but he was forced under FIA rules to sell it to Tom Walkinshaw. 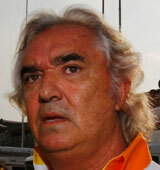 In 1996, with Benetton struggling, Briatore bought a share in Minardi which he again soon offloaded. In 1997 he was fired from Benetton, soon finding work with Renault's motorsport company Mecachrome. In 2000 Renault returned to F1 with the purchase of Benetton and Briatore returned to his former employer as team principal. In his first spell he found Schumacher, in his second he discovered Fernando Alonso and won drivers' and constructors' titles in 2005 and 2006. But as had happened before, the star moved on and the team consequently struggled. In 2007 Renault was engulfed in a scandal when it was found to be in possession of McLaren documentation. It was found guilty by the FIA but remarkably escaped punishment. However, less than two years later there was no escape after it was revealed Nelson Piquet Jnr had been instructed to crash during the 2008 Singapore GP to help the team. Briatore, who quit the team after initially denying the claims, was slapped with an indefinite ban by the World Motor Sport Council. But that decision was overturned when he appealed to a French court. The decision means he will be able to hold onto his driver management business and could make a return to the F1 paddock in the future if the FIA's expected appeal isn't successful.